I hope you can see by the ruler that this clock is very, very small. It was built to fit inside the front panel of a radio tranceiver (yet to be built), alongside my panel mounting radio frequency counter. The switch on the right is used to set the time, it's a 3 position switch. In the middle, the clock runs normally, push the switch up and the minutes start incrementing at a rate of about 2 per second, push the switch down and the time goes up a lot faster. The clock uses CMOS 74HC series chips, which have a very low power consumption. It includes a rechargeable NiCad battery which charges up while the power (from the radio) is on, and runs the clock counters (but not the display) when the power is off. 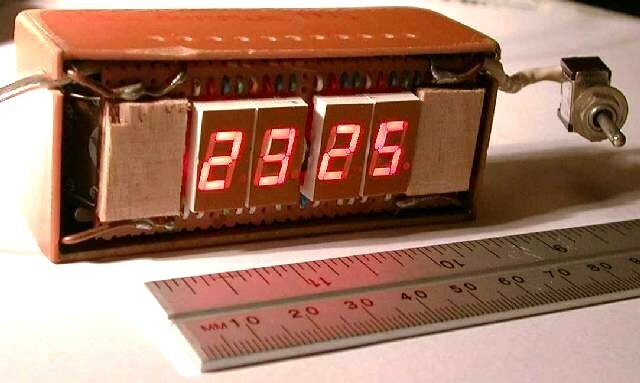 The clock is encased in single-sided unetched PCB material, soldered together on the inside into a box shape. The pieces of wood at either side of the display are meant to receive self-tapping screws to allow the clock to be attached on the inside of the radio tranceiver panel. The major problem this clock had was heat. Heat actually has partially destroyed the display. It shows 23:25 in this picture but the lack of clarity particularly in the 3 is caused by the fact that the displays at one time almost melted and bulged out of shape somewhat. 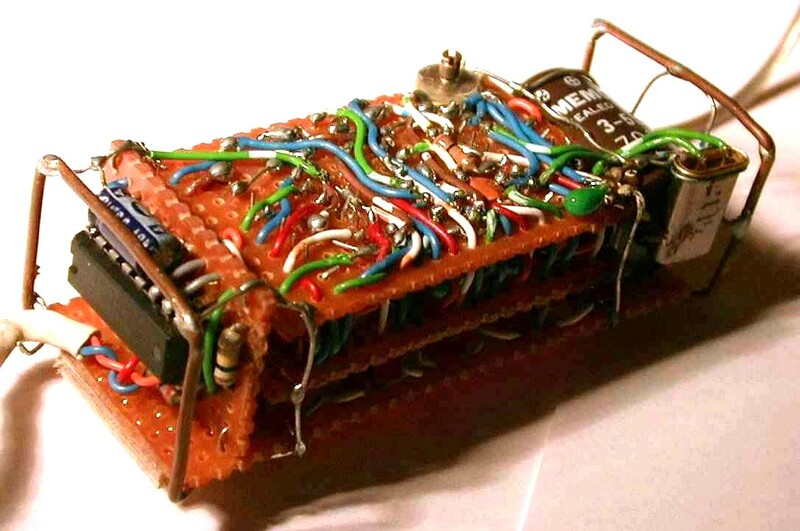 In this circuit I did away with any form of voltage regulator for the 7-segment LED displays. Instead, they all get the full wack of the 5V supply, or at least as much of it as the display driver chips can supply. But each digit is only shown on a 1 in 6 cycle, i.e. for one sixth of the time. This results in a bright and stable display but reduced heat dissipation because there are no lossy voltage regulators. In effect what you have is a switched mode voltage regulator. But I think I need to reduce the cycle to 1 in 8 or something, 1 in 6 is too much. One day I will get round to replacing the defective displays. Unfortunately due to how much I miniaturised the construction (see inside picture), that is something that is easier said than done. You live and learn I suppose. Construction: In the photos you can see that the circuit is built on a triple-decker vero-board arrangement. At the right the NiCad battery and quartz crystal can be seen. At the top of the picture you can see a small trimmer capacitor which is used to adjust the clock for accuracy. There was so little space that you might be able to see the chip on the end at the left of the picture: it's actually two piggy backed! The defective digits were replaced (with some difficulty), and the display duty cycle changed to 1 in 8. This little clock is now fixed in the front panel of my Polyphase receiver exactly as intended. I usually set it to UTC (GMT) and use it for logging the start and end times of radio communications. The clock does not generate any detectable interference in the radio receiver. The battery backup does not function well: I think that battery needs replacing.